At first, you need to measure your guitar neck and other elements. Then, you need to make a plan with on-body pencil drawings. You must know where to drill holes to mount the hardware (bridge, control plate, wiring, pickup) and where (and how) to fit in the neck. For example, to have the neck mounting place, you can drill hole by hole and then shape it by sanding. By the way, remember, the 12th fret must be right in the middle of the strings action. The surface and all sharp edges of the wood should be smoothed by using some light-grit sandpaper. The bridge should be connected with the guitar wiring grounding, to prevent electrical noises. To do that, you can connect one of bridge mounting screws with the potentiometer metal casing. Making a copper tape schielding is also a very good practice. 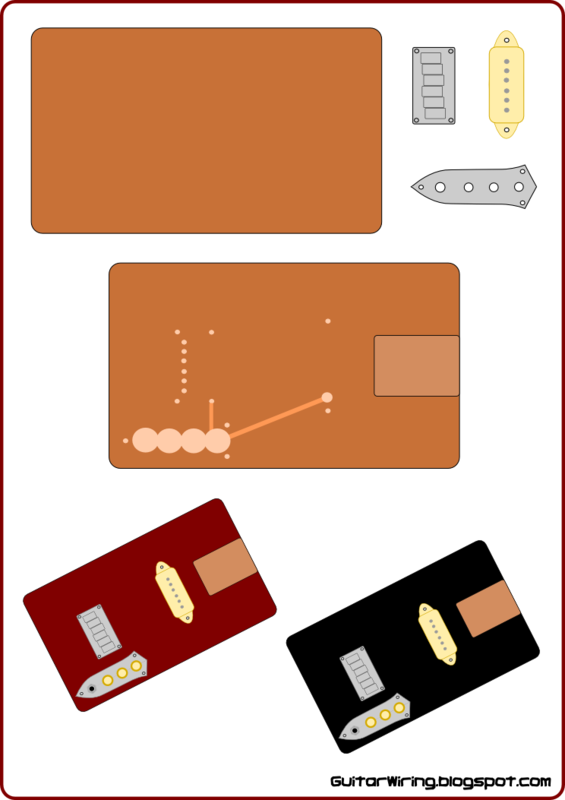 The JazzBass control plate have four holes. One is for the jack socket, others are for potentiometers, so there are many possibilities for making the wiring. For example, if you are making single pickup guitar, you can make the wiring with one volume potentiometer and two tone pots, one with 0,022uF cap and one with 0,01uF cap. If you want to have some simple control and you don't like an impact of having many potentiometers in the circuit, make a single pot wiring (only volume). BTW, on this blog, you can find many good wiring schematics. In my drawing, you can see some holes to mount the hard-tail bridge with strings-threw-body. To do this, you need some special ferrules. Strings-threw-body mounting, with no ferrules, will damage your wood. If you want some easier mounting method, choose some other kind of a bridge, for example wrap-around type. If you are not familiar with painting, try to use some wood wax finish. It can make a really nice look.